Quick post today cause me, Tim and Lola are on our way to a little vacay (does 3 days count as a vacation?) in Woodstock, NY. Courtesy of my dear friend Vicky, who let us stay in her house so I could get out of the city a little bit and relax. 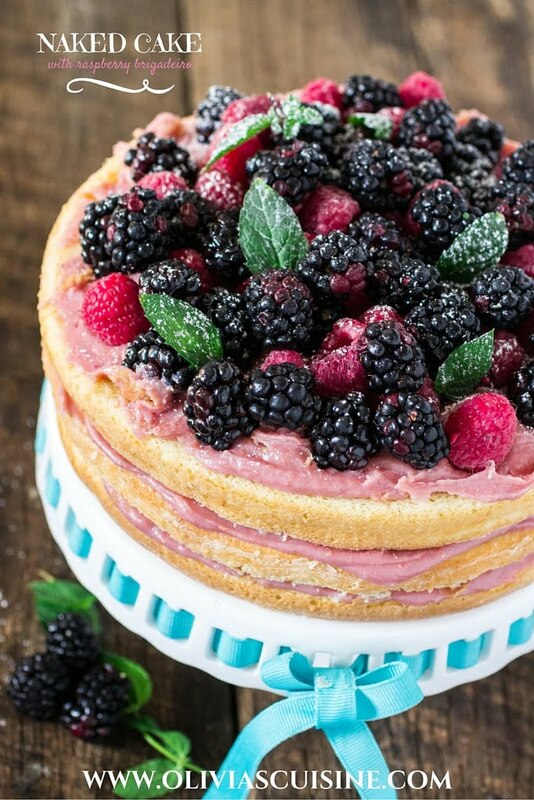 Anyways, I’m stopping by to share with you this delicious Naked Cake with Raspberry Brigadeiro to celebrate my 32nd birthday! Oh yeah, I’m 32 (can you believe it?) and I’m not ashamed to say it. A few years ago I even considered “staying” 25 for a while, since I look way younger than my real age, but then I realized how hard it would be if someone asked what year I was born. Can you tell I’m not a math person? So I’m owning up to my 32 and I’m pretty proud of what I’ve accomplished so far, including this cake. I made this cake to celebrate my birthday, but ended up bringing it to work on Friday to for my friend Linda’s birthday. Linda is a sweet yet strong woman whom I really admire. She’s a wife, mom, hard working manager and tells some of the best/funny stories that always make me laugh. Add to that the fact that she’s a Libra, like me, and that her birthday is one day before mine (and also has the same birthday as my grandma, whom I lost in 2006) and you’ll understand how she quickly became of my favorite people at work. Happy Birthday, Linda! I hope you enjoyed the cake! ??? But let’s talk about this cake. It consists of 3 sponge cakes which are brushed with a cinnamon sugar syrup so they can be extra moist. Don’t worry, they won’t taste cinnamon-y at all. The cinnamon just works as a flavor enhancer and makes everything taste even better! Simple. Easy. Incredibly gorgeous and delicious! I apologize there are no slice pictures. I wanted to bring it to work untouched, and thought I could bring home a slice to shoot later. But there were none left since the whole cake was devoured in a matter of minutes! In a small sauce pan mix the butter and the sweet condensed milk. Bring the sauce pan to the stove and heat it over medium-low heat. Cook it, mixing constantly (this is important, otherwise it will burn!) until it thickens and the brigadeiro starts to come off the bottom of the pan, about 10 minutes. Add the raspberry puree and the vanilla extract and mix until incorporated. Reserve to cool. In a small saucepan, mix the water with the sugar and the cinnamon stick. Bring to a boil and let it boil until the sugar is dissolved. Cool to room temperature. Using your stand (or hand) mixer, beat the egg whites until stiff peaks form. Reserve. In your stand mixer, beat the egg yolks and the sugar until fluffy and pale yellow. With the mixer on slow speed, add the oil and continue beating until incorporated. Then, add the flour in 3 parts, alternating with the milk, beating just until incorporated. Do not overmix! Fold in the whipped egg whites delicately and, finally, the baking powder. Butter and flour 3 9-inch cake pans. 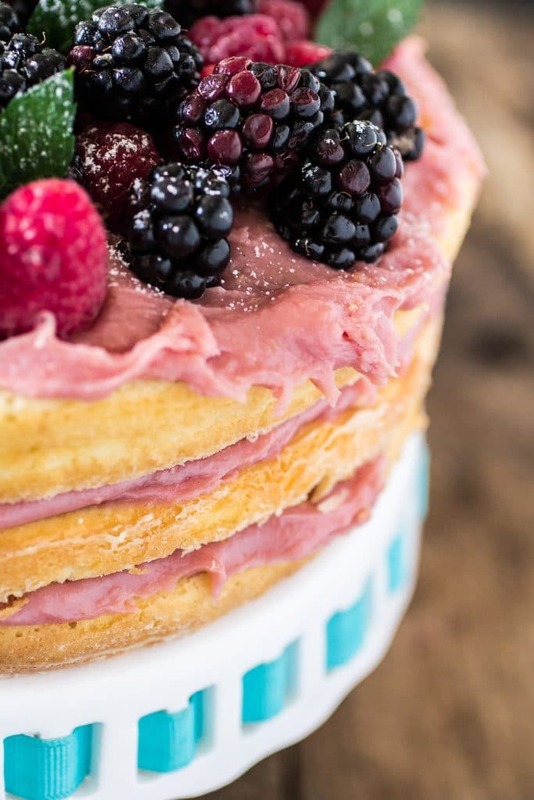 Divide the batter between the 3 pans and bake at the preheated oven for about 20 minutes or until a tooth pick inserted in the middle of the cake comes out clean. Let the cake cool before assembling. Start with one sponge cake, moistening it with some of the sugar syrup. Then add 1/3 of the brigadeiro, spreading it evenly with a spatula. 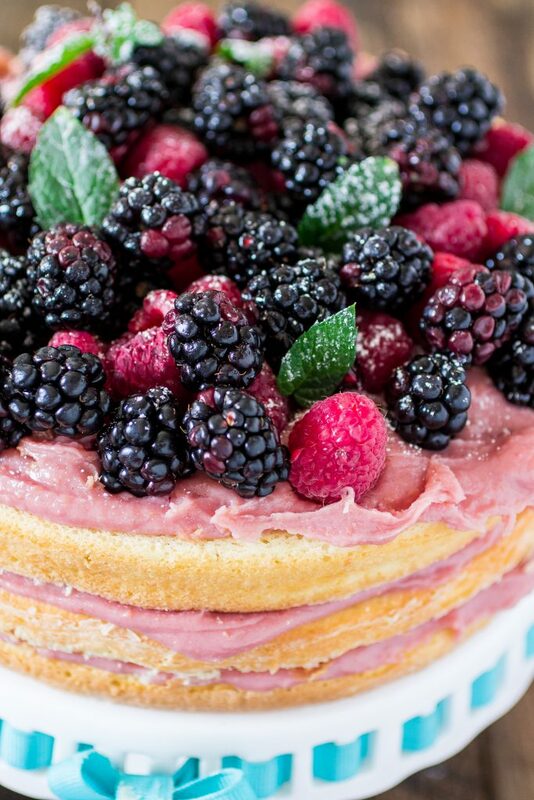 Repeat the steps above with the other two cakes, finalizing with raspberry brigadeiro and fresh berries to decorate. Happy HAPPY Birthday, pretty lady!!!! Hope you guys have a fantastic mini vacation! Tonight when I pour myself a glass of wine I will toast to you! ;) gorgeous cake! Perfect for a celebration of your life! Pinned! Cheers, girlfriend!! Happy Birthday Olivia! I hope you have a great day and have fun! The cake looks gorgeous! No wonder there were no slices left :) Pinned! Happy Happy Birthday to my amazingly talented friend!! Hope you had a great birthday, the cake looks super gorgeous! Happy birthday my dear. I am a libra too. So fun we have always something in comum ;-) Hope you had a great birthday! Yay for Libras! :) Thanks, dear. Happy Birthday! Enjoy your birthday getaway! I sure wish I could celebrate with y’all and have some of this beautiful cake!